What is The China Study? It started with the Cancer Atlas Survey. In the early 70s, China initiated a nationwide survey to collect information about cancer. The survey involved 2400 counties and 880 million (96%) of the population. To date, that was still the most ambitious biomedical research project ever attempted. The result was literally a set of maps detailing the presence and absence of certain types of cancer in China. It clearly illustrated geographically that some cancers were much more common in some places than others. Out of the the Cancer Atlas Survey came a joint study done by Dr. Colin Campbell of Cornell University, in partnership with Oxford University and the Chinese Academy of Preventative Medicine, in an effort to answer some interesting questions raised between diet and disease. This study ranged over 65 Chinese counties, 130 villages, and 6500 adults and their families. The results give a clear food roadmap for those interested in optimizing their wellness and minimizing their chances for certain types of cancer. The China Study is a book written by Dr. Colin Campbell summarizing his work in the field of nutrition, the results learned from the survey and research, and recommendations on how to optimize one’s health via a plant-based diet. We all want to be true the things we grew up believing (“drinking milk is good for bones,” “meat protein is better for you,” etc). However, lines dreamt up by Madison Ave ad execs may not be exactly fact. But as we all know, it is very hard to change minds and habits once those ideas have become part of the culture. Clearly entrenched interests (the dairy industry, the cattle/pork/chicken industries, the health-care industry, etc) would NOT benefit from a shift to a plant-based food economy. Their experts will reference their own studies on the health benefits of their respective products, all the while poking at Dr. Campbell’s work. Don’t get us wrong, we love the taste of a juicy ribeye steak, a rack of BBQ pork ribs, and ice cream with mix-ins. However, it would be silly to keep eating those foods if they are harmful. Compared to most of the world, the US is a country overflowing with riches. It is also afflicted with a disproportional amount of certain types of diseases (heart attacks, obesity, diabetes, breast and colon cancers, osteoporosis). In the book, Dr. Campbell asks and answers the question of why that is so. Data from The China Study gave him the correlations needed to direct his research in order to discover the cause. The results of both the population studies and laboratory research were disturbing, fascinating, and illuminating. Compelling enough to make us seriously reconsider our beloved meat-based diet. 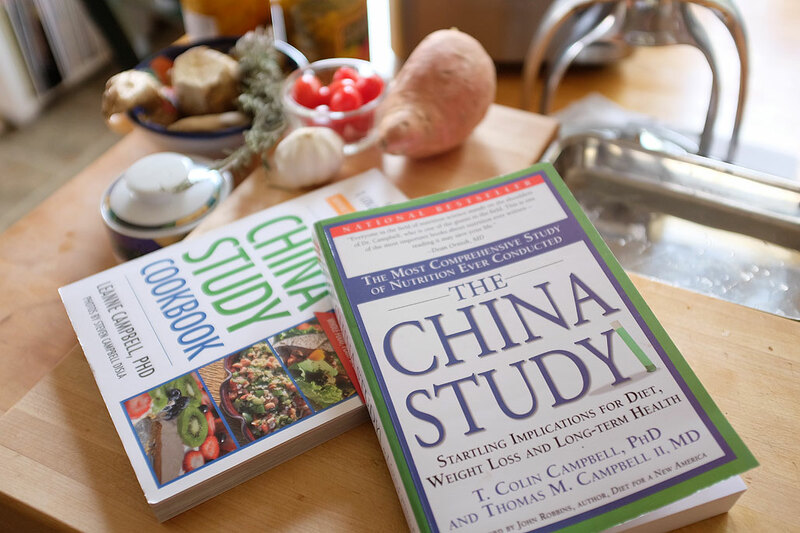 To make the transition to a plant-based diet easier, we decided to check out the companion to The China Study, The China Study Cookbook, written by Dr. Leanne Campbell. 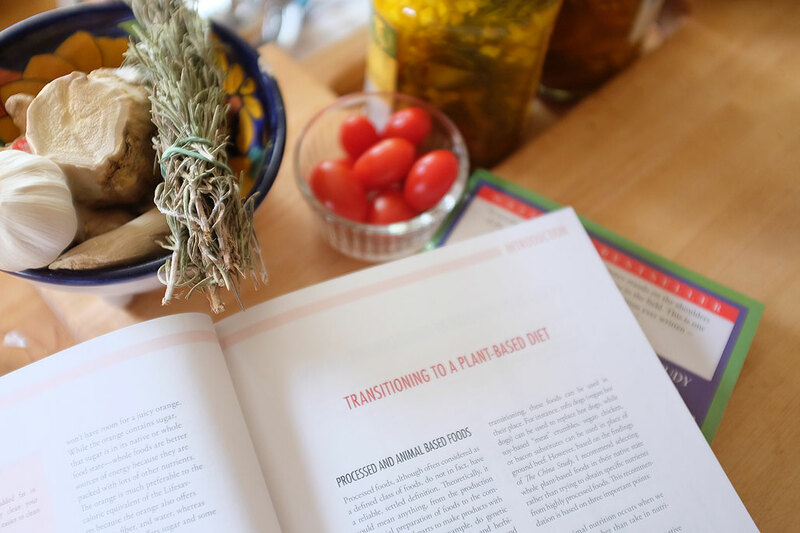 This cookbook has over 120 whole food, no-oil, plant-based recipes. Not only are these recipes good for you, they do it without sacrificing flavor! The author emphasised that the recipes in the cookbook are just starting points. Readers are encourage to experiment, modify, and substitute ingredients to create what work for them. To that end, Dr. Campbell has included a large list of alternatives for milk, egg, oil, salt, and sugar. We did not know that prune paste (pitted prunes and water blended in a food processor) is one of the best oil substitute for used in baking cakes, cookies, and sweet breads. While we have no dog in the financial side of this food fight, we are interested in how the food we eat can help us optimize our health. Readers who are intrigued should definitely check out the documentary Forks Over Knives and the book The China Study. Sustainability and environmental arguments against a meat-based diet aside, the data of the health benefits of a plant-based diet is very compelling. We’ll post updates of our continuing efforts to eating healthier later in the year.